Buddy Toss is one of the most addictive “one-tap” games available on Android right now. Gameplay is dirt easy. You will have to tap the screen to toss a person into the air. Keep tapping the screen at the right moment to avoid falling to the ground. Each time to tap the screen, the strongman hurls his buddy higher up into the sky. Things become more exciting when his buddy reaches dizzying heights, but the real fun happens when he is thrown into space. Of Course, it’s not that easy as the strongman needs lots of stamina and if he loses power, his man will fall to the ground with a loud thud! In Buddy Toss, it’s all about timing and the toss meter on the right side of the screen does make it a bit easy for you to time your tosses, at least in the beginning. When you hurl your friend up into the air, pay attention to the meter. Noticed tiny pics of your buddy and the strongman on the meter? Tap the screen when your friend falls down and his pic is on the bar is in the green zone, but just above your strongman’s pic or aligned with it. Things will be more difficult when your friend is tossed higher up into the air, above the clouds and the weather balloons. This is when the green zone decreases with every toss. You should stop relying on the toss meter when the green zone is too small and tap at the right time when your friend is just above the strongman. Easier said than done, but by the time the green zone shrinks, you will get into a rhythm and will be able to time your tosses most of the time. Just be alert when the screen zooms in at the strongman as the guy falls down and tap at the right moment to toss him higher up into the air. Tip: Make sure you tap when your buddy is at the lowest point on the green zone. You will need a bit of practice to do this, but remember that the closer he gets to the strongman the higher he will be hurled into the sky the next time you tap the screen. Do this and also upgrade “Size” to throw your buddy higher up in the air every time you tap the screen. Besides paying attention to the toss meter, you should also keep an eye on the strongman’s power bar. The power bar is on the top-right corner of the screen. The strongman’s stamina level decreases by certain points every time he tosses his friend up. When he has no energy left, a call-out will appear above him on the upper-right corner of the screen suggesting he can’t toss his friend up anymore and your friend falls flat on the ground despite tapping the screen. 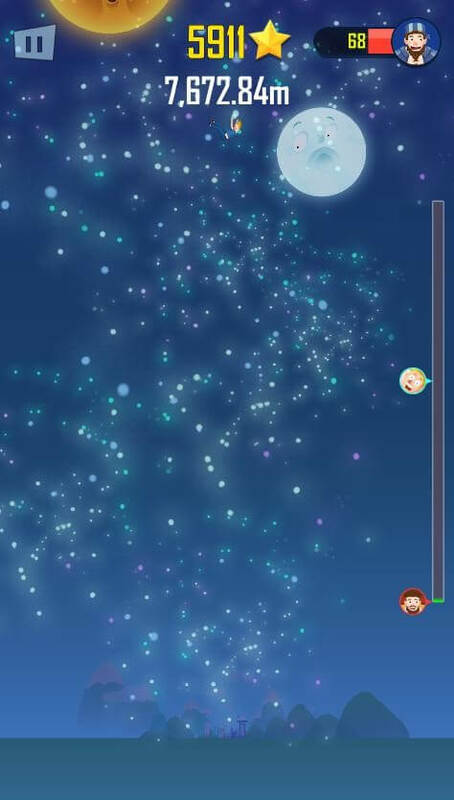 To boost his stamina, you will have to level-up his power, which is shown on the left side of the home screen. You will need stars to upgrade power. You can get stars easily from main game and story mode games. When you upgrade power, you will notice that the strongman’s power has increased. Increasing his power will allow you to toss his buddy up in the air a greater number of times than before. 3. Should you Upgrade a Strongman’s Size? Along with power, you can also level-up a strongman’s size. When you upgrade size, you will notice the strongman gets bigger. But does it have any effect on his tosses? Yes, it does. Each size upgrade makes him beefier. With every tap at the right moment, a beefy strongman will throw his buddy much higher up than what he used to before upgrade. Along with leveling up power, you should also consider upgrading size if you want to beat your previous high score. Buddy Toss has two game modes – the main game and a “stories” mode. The main game lets you score higher to compete with other players on the online leaderboard. 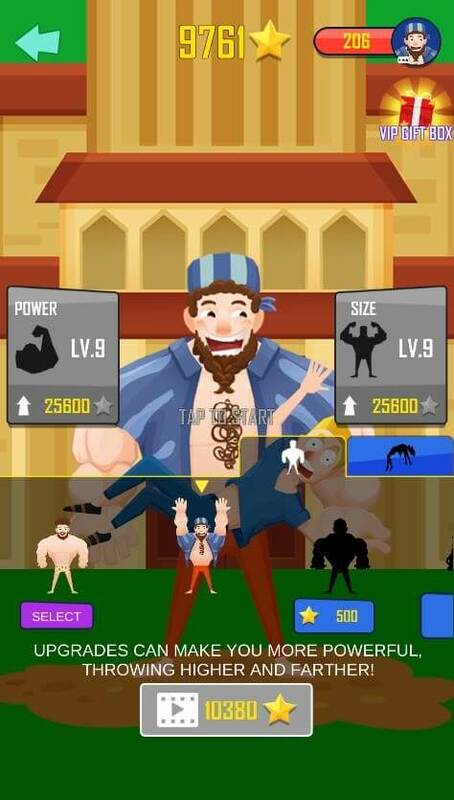 In this mode, you can upgrade your strongman’s size and power, purchase and select several buddies and strongmen. Stories mode is pretty interesting. Currently, it features two stories – Buddy Thief and Defend Farm. 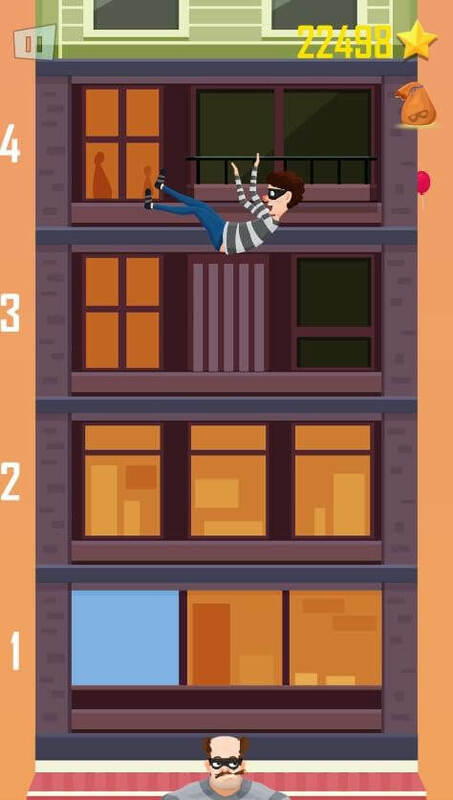 In Buddy Thief, you will have to help two thief brothers steal objects hanging on multistory apartment’s balconies. All you have to do is tap to toss a thief and when he reaches closer to an object, tap again to collect it. Each collectible item earns you stars. The more items you collect, the more stars you will earn. In Defend Farm, you will have to destroy a UFO that’s been abducting sheep every now and then. Tap to toss your buddy and when he comes closer to an unidentified flying object, tap again to shoot it down. Just don’t hurt the sheep below it when shooting. In this game mode, you can buy various weapons and then use them to shoot down UFOs. I know the second game sounds more interesting, but personally I loved Buddy Thief. Besides adding stolen items in a separate “collection” page, you will earn a lot of stars. You can easily earn more than 3K stars in a game and use them to upgrade size and power or purchase more characters in the main game. Make sure you practice tossing buddy in the main game before playing the buddy thief game mode. You can play the main game and stories mode to earn stars, but there’s another way to get them. All you have to do is watch videos to get 2K+ stars. To watch a video, tap the “Play” button on the home screen and then tap the video button on the bottom of the screen. Spend stars wisely. Your priority should be to spend them on upgrades. You can use stars to purchase new strongmen and buddies later. Login in daily to get stars. On the fifth day, you will get +1000000 stars, which will help you upgrade your character’s power and size and even buy few new buddies and strongmen.